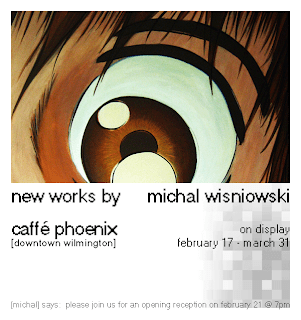 An exhibition of my new work will be on display at Caffé Phoenix, beginning February 17 and running until the end of March. The Caffé Phoenix is located downtown Wilmington, on Front Street. Here is a google map. The opening reception will take place on Thursday, February 21, at 7 pm. Snacks will be available, and the restaurant itself will be open for business. So come join us for some new artwork, and grab a snack, dinner, or a drink at Wilmington's most pleasant bar from Joel Finsel.